When the ideas of academic economists are put into practice in the real world, the outcome is usually failure. Invariably, what sounded fine in the faculty lounge turns into a disaster when real people become guinea pigs in monetary experiments. There are many examples, from the abandonment of gold by the U.S. in 1971 to reckless money printing of QE1, QE2, and QE3 from 2008 to 2014. The latest disaster is in India. As usual, the highly educated political elites implemented a hare-brained policy, and the poor are left to suffer the worst consequences. 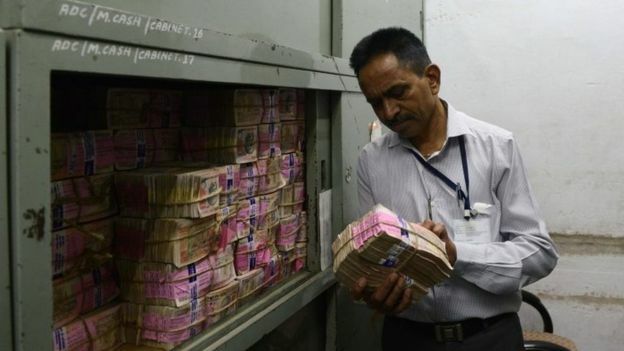 On November 8, 2016, while the world was awaiting the results of the U.S. presidential election, Prime Minister Modi of India declared that 86% of banknotes in circulation in India were contraband — no longer legal tender. This decree represents one of the largest wealth confiscations in history. The Indian economy, seventh largest in the world, has been thrown into chaos as a result. The disaster in India is just beginning. Prime Minister Modi of India declared 1,000 and 500 Rupee notes to be illegal. Indian citizens lined up to exchange the illegal notes for credits to digital accounts. They found banks closed and ATMs offline. Riots emerged in some places. Apart from being the seventh largest economy in the world (over $2 trillion in annual GDP), India has the second largest population (about 1.3 billion people, not far behind China), and is the seventh largest country by landmass. In short, India is a juggernaut, not some smallish state like Cyprus where monetary experiments have also been imposed. Despite aggregate wealth and size, India is undeniably poor on a per capita basis. Its annual per capital income is about $1,600, ranking India 140 among the 189 members of the IMF, just behind the small island nation of the Solomon Islands. Even that low per capita number does not capture the extreme income inequality in India. There is a large middle class of perhaps 300 million people with an average annual income of about $7,000 per person, considered middle-income by global standards. This leaves the remaining 1 billion people with an average income of only $600 per year. Truly a tale of two countries. For a country with those demographics and economics, reliance on cash is not surprising. While cell phones and digital payment systems are spreading, and may be the wave of the future, India is overwhelmingly a cash economy today. Into this mix was thrown a dangerous economic experiment thought up by some big brains at Harvard, including Professors Larry Summers and Ken Rogoff. Summers has been banging the drum for the elimination of the $100 bill in the U.S. Rogoff has gone further calling for the complete elimination of cash. Their ideas are gaining traction in places like Sweden, which is almost totally cashless, and Europe, where Mario Draghi and the European Central Bank recently halted the creation of new €500 notes. This global war on cash is covered in detail in Chapter One of my new book, The Road to Ruin. The Prime Minister of India, Narendra Modi, is typical of the Summers-Rogoff global elites. He has a graduate degree from one of India’s top universities, and is a regular attendee at G20 and BRICS leaders’ summits around the world. His policies are based on the “neoliberal consensus” approved by the global elites. Applying global elite programs to a poor, traditional, cash-based society was a train wreck in motion, and now the train has jumped the rails. As noted above, on November 8, Prime Minister Modi declared the 1,000 rupee note and 500 rupee note to be illegal. In case those sound like high-denomination bills, they’re not. At current exchange rates, the 1,000 rupee note is worth about $14, and the 500 rupee note is worth $7; roughly equal to the $10 and $5 bills you probably have in your purse or wallet. Citizens were allowed to bring these notes in and exchange them for smaller denominations, or a new 2,000 rupee note worth about $28.00. The problem was that the lines were horrendous and the economy shut down as millions waited in line to make the exchange. The government compounded its incompetence by not printing enough of the new bills. Some banks closed because they quickly ran out of the new bills. Even worse, the new bills were a different size and did not fit in ATMs, so every ATM in India had to be shut down and recalibrated to handle the new sized bills. A cash shortage in a cash-based economy meant that economic activity ground to a halt. Farmers and fisherman could not buy fuel or provisions needed to bring their crops or catch to market. Food shortages popped up; riots broke out in some places. Finally, in a “guilty until proven innocent” twist, tax inspectors were waiting at the bank branches to interrogate those exchanging large amounts of the old notes. This dissuaded many from making the exchange in the first place. A black market grew up in which you could exchange 1,000 rupee notes for, say, 700 rupees in smaller bills that were still legal. Those offering the exchange had political protection or paid bribes to avoid the tax scrutiny that came with the larger bills. This exchange is the ultimate market distortion — “cash” trading at a discount to face value because of government interference. The government pretends this is all being done to flush out so-called “black money” and put an end to tax-avoidance and the underground economy. But, in a poor, rural, cash-based nation, the underground economy is the economy. The informal sector is not underground; it’s normal. Over the last three weeks, I have made a strong appeal for increased cashless transactions. Large volumes of liquid cash are a big source of corruption and black money. Today we live in an era of mobile banking and mobile wallets. Ordering food, buying and selling furniture, ordering a taxi…all of this and lot more is possible through your mobiles. Technology has brought speed and convenience in our lives. I am sure most of you are using cards and e-wallets regularly but I thought I must share with you ways through which increased cashless transactions are possible. Learn how this digital economy works… Learn about card payments and other electronic modes of payment. Look at the malls and see how they function. A cashless economy is secure, it is clean. You have a leadership role to play in taking India towards an increasingly digital economy. There you have it. Somehow, a poor village fisherman in a remote part of India is supposed to master “mobile banking…mobile wallets…and e-wallets” just like that. It’s hard to think of a better example of just how out-of-touch the elites are with their own people. Modi’s statements also reveal the hidden agenda of the global elites. Moves like the one in India have nothing to do with tax evasion, which will continue anyway with the new larger bills. Modi’s plan has everything to do with creating a cashless society where small savers are rounded up into digital pens at big banks. They are like lambs led to the slaughter through negative interest rates and asset freezes. Despite Modi’s protestations, his move was an historic blunder. It’s too late to undo it. The damage to the Indian economy is done. The effect of abolishing cash in a cash-based society is the same as any central bank reducing the money supply. It’s a tightening policy move that will slow the Indian economy. This makes India a much less attractive destination for foreign direct investment. Also the crackdown on cash is causing capital flight and increasing the demand for hard currency and gold. But the elites will continue to push for the cashless society, regardless of the pain it causes everyday people. You need to be prepared.